In the 1960s, Kamal Al-Solaylee' s father was one of the wealthiest property owners in Aden, in the south of Yemen, but when the country shrugged off its colonial roots, his properties were confiscated, and the family was forced to leave. The family moved first to Beirut, which suddenly became one of the most dangerous places in the world, then Cairo. After a few peaceful years, even the safe haven of Cairo struggled under a new wave of Islamic extremism that culminated with the assassination of Anwar Sadat in 1981. The family returned to Yemen, a country that was then culturally isolated from the rest of the world. Prior to this year, a lot of the books I've read were non-fiction books focusing on life in the Middle East and the impacts that war and terrorism have on the people that live there. Although this book wasn't completely centred around a war, I still thought I'd be able to connect with it a lot quicker than I did. This book is a memoir of Kamal Al-Solaylee's life. He details his family's luxurious life in Yemen and their immediate exodus into Beirut after his father was kidnapped and forced out of the country. From Beirut, his large family flees to Cairo to save themselves from the ever growing danger. It is in Cairo where Kamal begins to recognize that he is different from his brothers and most boys his age. After a brief visit to the UK to visit his sister, Kamal returns to Cairo a different man. One that is confident in who he is and begins to explore the underground gay scene in Cairo. By this time he was in his early twenties and enjoying a somewhat frivolous life. Just when he was getting comfortable in this new lifestyle and new found freedom, his father decides to uproot the family once again and return to Yemen, their homeland. Now in his twenties, Kamal dreaded the return. In Yemen, he was required to complete one year in military service. After acting as a translator, a unique opportunity to study abroad in the UK. Kamal jumped at the chance to leave Yemen. Only one thing appeared to hold him back, telling his mother. She instead was surprisingly supportive with a one word response, "escape". Now in his fourth country of residence, Kamal studied at Keele University earning himself a PhD. In English. During his studies, he continued to search for a way to escape his homeland and become a citizen in a western country. His search eventually ended when he met an immigration official from Canada. In December 1995, his wishes were granted and was eligible to claim residency in Canada. Before immigrating he stayed in England long enough to confirm that he completed his PhD and flew to Toronto that same week. His lifelong dream has now come true. Kamal gives us a look at his new life, struggles and freedoms that he worked through in his first years in Toronto. In this final chapter we also begin to see the final disconnect between him and his family in Yemen. 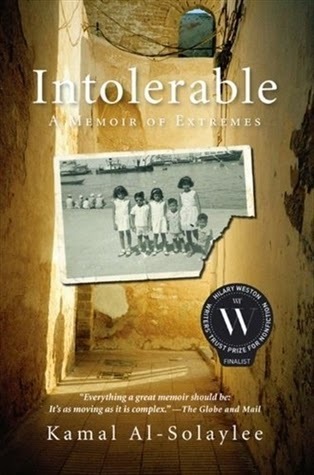 I think Intolerable is a very fitting title for this memoir. Kamal outlines his journey through countries that he could not stand to live in. For me, the book started off a bit slow but I know it was necessary to educate readers on the state of the Middle East at the time. There were parts that I enjoyed specifically Kamal's journey to finally be himself in Cairo and reading about his early life in Toronto. I just wish there was more of it. I would have liked to learn more about his transition into his new, permanent, home. I would recommend this read to anyone who is looking to learn about the history of Yemen and its people's struggles. I also think those who are looking for a glimpse of what it was like to grow up in the Middle East in the 1960-1980s would appreciate the details of Kamal's life. This is fourth book in the Canada Reads 2015 series that I've read. The Inconvenient Indian by Thomas King is the last one on the list. Once I've read and reviewed it, I'll be posting a summary of my thoughts on all the books and reveal my top two contenders. Did you know you can shorten your urls with AdFly and receive cash for every click on your shortened urls.